I'm really digging the old-school charm of this poster, it's refreshing compared to the standard techniques you can expect out of a modern Hollywood marketing team. The ending of Planet of the Apes was rife with sequel opportunities. 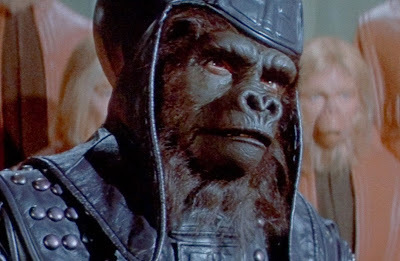 When I first heard that there were five films in the original series, I naturally assumed that they chronicled how man breaks free from ape oppression and retake the planet for themselves. As it turns out, this was the direction which the producers originally were planning to take. Pierre Boulle, who wrote the novel which the first film was based on, created a script which centered around Taylor leading the humans into war against the apes, led by General Ursus. While this script was rejected, the overtones of war and character of Ursus both made their way into the final film. Paul Dehn and Mort Abrahams then took a crack at script writing, with Dehn inserting the elements of atomic paranoia into the film. Thankfully one idea of Dehn and Abrahams' which was dropped was that of a half-human, half-ape child... I just can't see that having worked out in the slightest (watch Howling III: The Marsupials and try to convince me otherwise). All of the major actors from the previous film returned to reprise their roles, although not as one would have hoped. The biggest blow to Beneath's success was that Charlton Heston wanted nothing to do with it. This was incredibly unfortunate and I'm not sure why Heston was so opposed to it - perhaps he didn't consider the Apes franchise "serious" enough work for a Best Actor winner. As a result of his apprehension to appear, the film was drastically rewritten to allow Heston to stay out of it as much as he could. This put a serious damper on the natural progression of the series, although it probably ended up giving the franchise a greater longevity in the long run. Roddy McDowall also couldn't appear in the film due to scheduling conflicts, but did show up in the form of archive footage. This makes Beneath the only original Apes film in which McDowall was not directly involved (and one of two Apes media in which he wasn't involved - there were two TV shows created after the original series ended, one of which featured McDowall in a starring role). Aside from that, the rest of the original cast appeared although their screen time was generally reduced. As for the new cast, the film stars James Franciscus as an American astronaut, Brent. He does an okay job in the role, but one can't help but feel that he was only cast because he looks like Charlton Heston in wide shots which can be used in the trailers to convince people the movie stars Heston instead. There's also the fact that once Heston does appear in the film he absolutely overpowers Franciscus, although that's more of a credit to Heston's screen presence. I guess in summary, Franciscus does an okay job but he's hindered by being forced to play a lesser version of someone else. The other major new character is the gorilla general, Ursus. He's basically a chest-thumping, overt villainous character, but he's a lot of fun to watch on screen. Also, he has a great design and is probably one of the more iconic characters in the franchise, despite only appearing in this film. It should also be noted that McDowall's Cornelius was recast, with the character being played by David Watson. Watson does an okay job, but like Franciscus his performance is completely overshadowed by the actor he's replacing, not to mention that he looks noticeably different. Quiz time: which apes are convincing prosthetics and which are obvious Halloween masks? If you said the ones with the gaping mouths are the masks, then congratulations. In pretty much every scene with orangutans and chimpanzees, these poor effects are very noticeable and distracting (the gorillas seem to get off the hook since they have a greater focus this time around). On top of that, Beneath relies far more on special effects than the original film did, but they look pretty terrible all-round. The film uses poor cartoon overlays, bad looking "cut-out" characters and obviously fake matte paintings throughout, when such things were unheard of in the original after the first 5 minutes. As a result, Beneath looks very dated. Oh and on top of all that, the first 3 minutes of the movie are just reused footage from the original. Remember how I said that reusing footage is basically the worst excuse to cut costs? Anyway, onto the film itself. The movie revolves around Brent, an astronaut who crash lands on future-Earth while on a mission to rescue Taylor's crew. While this doesn't make a lot of sense (since Taylor's crew were intentionally on a one-way journey), it's more egregiously contrived as a means to get another talking human into the picture. Really, it just smacks of laziness on the part of the writers. Anyway, Brent ends up stumbling across Nova and discovers that she knows Taylor because she has his dog tags... wait a second. Taylor's possessions were stolen from him by the humans and then apes when he was captured... where the hell was he hiding his dog tags this whole time!?! If he was played by Christopher Walken then we'd probably know, but as it is I'd rather not venture a guess (aside from stating that this is yet another another lazy, poorly-thought-out plot contrivance). 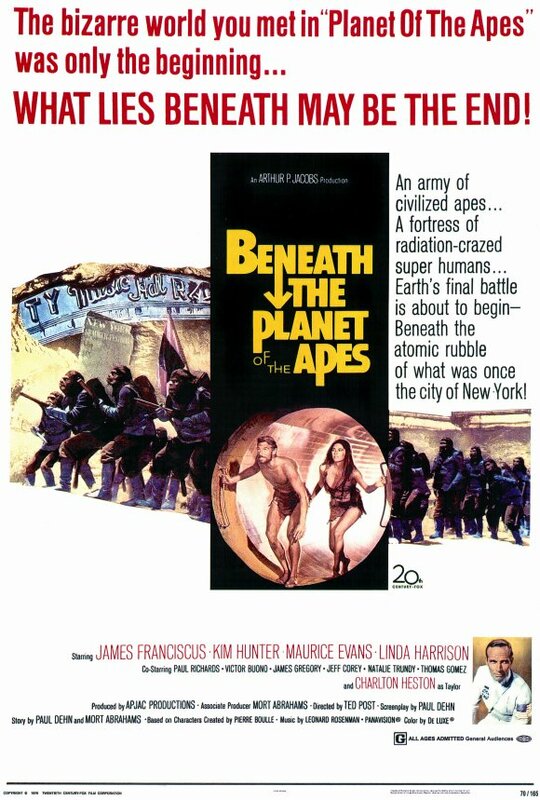 Over the course of the first 40 minute, Brent and Nova run into the apes, get captured, escape 5 minutes later and then make their way into the forbidden zone. This is another issue with Beneath and Heston's lack of involvement, as the first 40 minutes are a complete rehash of the plot points of the first film. If Heston had returned, or a different narrative been considered, the audience could have been saved from having to watch a much weaker rendition of the first film. Blehhh... understandably, when the hoods come off this is quite a shock to the viewers. In fact, the whole sequence that this appears in is probably the strongest in the entire film. Unfortunately I can't find a Youtube clip of it, but the sequence involves the mutants worshipping an atomic bomb in a religious service which apes Sunday morning worship services. Lines such as "Glory be to the Bomb, and to the Holy Fallout. As it was in the beginning, is now, and ever shall be. World without end. Amen" really crack me up as someone who attended (and still does attend) church. While I won't exactly agree with the sentiment that religious people are dangerous fanatics, I can't deny that this scene is spot-on and is the only really good use of satire in the whole film. The film barely even tries to be humorous or satirical. There's a group of hippy chimpanzees which seem to try to tie the film into the Vietnam War, but otherwise it generally plays the premise straight. With all the promise of the mutants being added to the plot, it's just too bad that the ending is such a downer. Heston and the studio head wanted to kill the series for good, and did a damn good job of trying... that is to say that they gun down Nova, then all of the mutants, Brent, Ursus and Taylor, who detonates a bomb that wipes out all life on Earth in the process. That's right, they kill off the characters so thoroughly that they kill the Earth itself. Damn, that's... that's a bit harsh. Geez. Is it possible to have a bleaker ending than this? It's just so pointlessly nihilistic, and the ending narration doesn't help this perception any: "In one of the countless billions of galaxies in the universe, lies a medium-sized star, and one of its satellites, a green and insignificant planet, is now dead." That's cold man... cold. Heston must have really wanted to get out of the series. 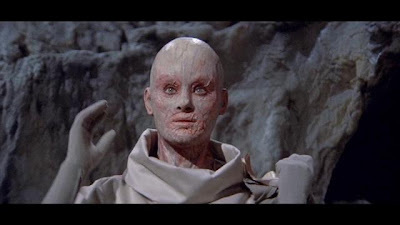 Still, Beneath might still have been half-decent entirely due to the second and third act with the mutants if it had been filmed a bit more proficiently. New director Ted Post doesn't do half as good a job as Franklin J. Schaffner did, and the film feel like a bit of a jumbled mess at times. The pacing is totally off in the first 40 minutes, and the editing doesn't help it to flow much better. On top of that, many of the attempts at action scenes are very poor, such as the scene where Brent fights an ape atop a wagon - the scene is just plain terrible, with bad editing, no music, no dialogue and no real suspense. The film also obviously suffers from a weak, butchered script where many of the characters are practically useless (Nova being the most egregious offender, she's basically just a useless tag-along for 99% of the film... also, is it just me or is she wearing even less clothing this time around?). That said, Beneath is buoyed mostly by some good ideas (the apes going to war, the mutants, the bomb), expanding the mythology (learning about the gorilla caste) and a few good sequences (the bomb worship scene, the bleeding Lawgiver and crucified gorillas illusion), but it's very weak overall. Be sure to come back soon for part 3 of this retrospective series, Escape from the Planet of the Apes!